Raivavae — Anderson B. Mayfield, Ph.D. Please go here for the high-resolution maps. To read a description of the reefs of Raivavae, please see the field report, as well as Mayfield et al. (2015, Platax). For information on the sampled colonies (n=18), please see the latter manuscript, as well as Mayfield et al. (2016). 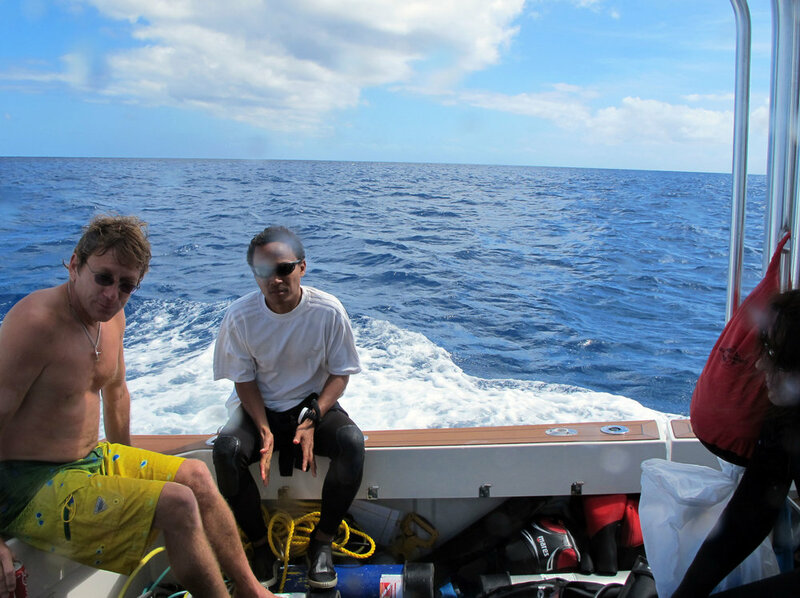 For more information on the reefs of Raivavae and Tubuai, check out this blog. For high-resolution maps overlaid with a variety of GIS and environmental data (see example to the right. ), please see the newly completed KbSLOF maps page: https://maps.lof.org/lof. None of the 18 samples colonies were found to be displaying aberrant behavior at the time of sampling based on analysis of nine molecular+physiological-scale response variables (ibid). 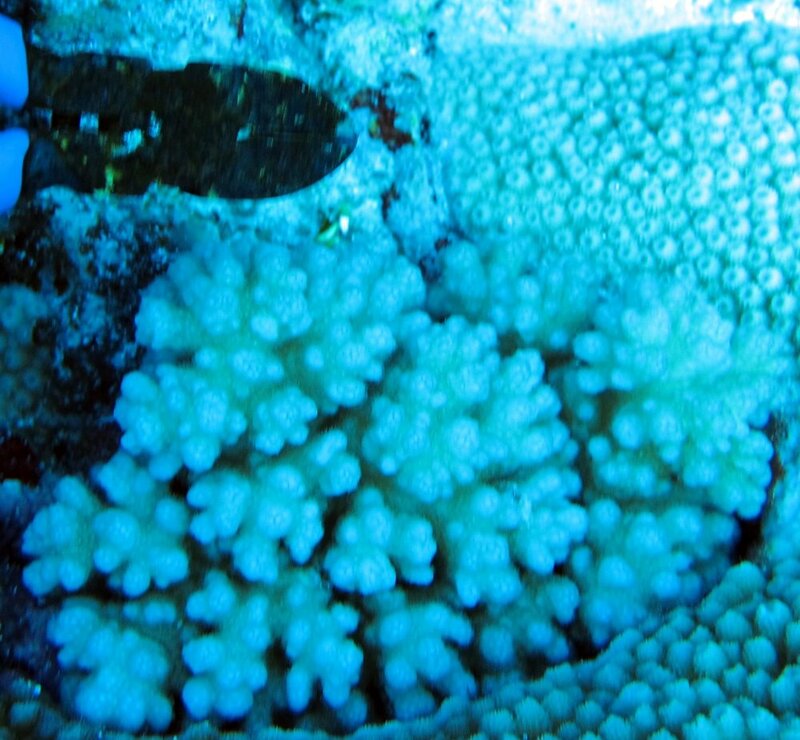 For the sampled coral colonies for which only thumbnail images are presented, click on the image to be taken to a new webpage featuring a higher quality image that can be downloaded (i.e., NOT a thumbnail). This was my first time to ever use an underwater camera, so, if the images appear poorly white balanced or blurry, it is my fault (and not a result of compressing them down to thumbnail size). 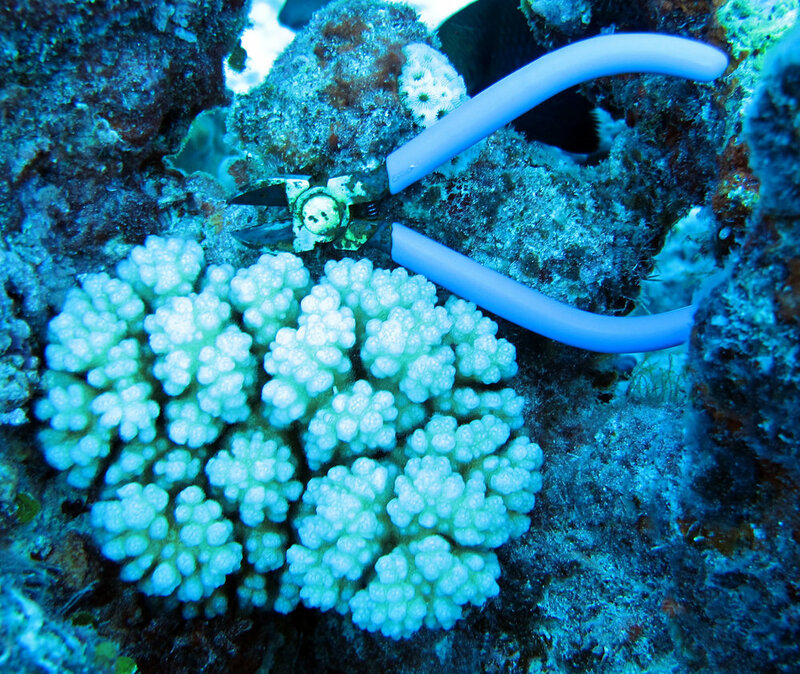 Hyperlinks to data files have been placed within images of the corals analyzed in detail. AURV01 (Raivavae site 1) Apparently, I had not yet heard of white balancing in 2013. Sample was neither genotyped nor analyzed in detail (nucleic acids and proteins degraded). Click here for data from this colony. Click here for data: JMP or Excel. AURV06 (Apr. 12, 2013)-no habitat shots. Five colonies sampled . Click here for more information about this sample, which was not processed in full. Sample was not processed since RNA extraction failed. Other data can be found here. Pocillopora damicornis genotype alpha (best guess; sample was not genotyped due to failed DNA extraction). Sample was not analyzed in detail due to poor preservation of nucleic acids. Click here for other data. DNAs performed poorly in real-time PCR, so sample was generally not considered in statistical analyses. Data can be found here. Sample was poorly preserved, and nucleic acids were degraded. Sample was not analyzed in detail, but other, non-molecular data can be found here. This colony was also not analyzed in full due to poor nucleic acid preservation, but other sample data can be found here. Nucleic acids were also poorly preserved in this sample (I do NOT recommend RNALater! ), but some data can nevertheless be found here. Nucleic acids were poorly preserved, so sample was not processed in detail. Some data can be found here. Sample was not analyzed in detail due to poor preservation of nucleic acids. Other sample data can be found here. Sample was not genotyped nor analyzed in detail due to poor preservation of nucleic acids. Click here for other details of this colony. Yet another sample whose RNAs and DNAs were poorly preserved with RNALater. Consequently, biopsy was not analyzed in detail. Click here for other sample information. Finally! A sample whose RNAs and DNAs were well preserved with RNALater. For the data in JMP format, click here. Otherwise, here is an Excel file. Another sample from Raivavae whose RNAs and DNAs were actually well preserved! Click here for data in JMP format (or here for Excel). AURV08 (Apr. 13, 2013)-no habitat shots. Six colonies sampled.